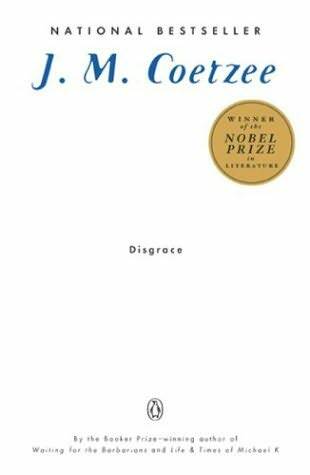 At the center of Disgrace, published in 1999 and recipient of the Booker Prize and the Nobel Prize in Literature, is David Lurie, an English professor in post-apartheid South Africa. It might be that I had trouble with this story because I found the main character to be so unlikable. Past his prime, with two ex-wives, Lurie is nonetheless a womanizer who has little respect for boundaries. The story opens by describing his weekly visits to a prostitute for whom he develops a fondness, which on some level he assumes is reciprocal. When this young prostitute, who has two young children, leaves the agency that employs her – because of Lurie – he tracks her down and calls her at her home. That he would cross a line that seemed so clear was a little appalling. After his “relationship” with the prostitute comes to an abrupt end, he develops an attraction to one of his students – a girl less than half his age, and younger than his own daughter – and pursues her pretty relentlessly even though he understands that it’s wrong, and even though the girl herself is far less than enthusiastic or welcoming of his advances. A brief “affair” ensues – I use the term loosely because it seems obvious that the girl succumbs at least in part due to the imbalance in power, figuratively and literally, between herself and her professor. The relationship ends up putting an end to Lurie’s teaching career. Having now resigned from his position at the university, Lurie retreats to his daughter’s farm, where he is welcomed though he and his daughter have a somewhat strained relationship. A violent attack takes place, and Lurie begins to realize how utterly powerless he really is in his life, in the world. Overall, it’s a bleak little story with political overtones about race issues, the exploitation of women by men, and the precarious imbalance of power among people. Nothing is black and white.